A Saudi teenager who fled her family and got stranded at a Bangkok airport has arrived in Canada after being granted asylum there. 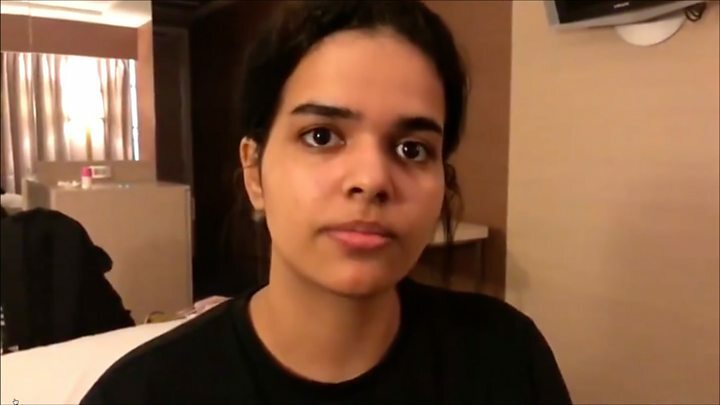 Rahaf Mohammed al-Qunun, 18, had been trying to reach Australia via Bangkok but was initially told to return to Kuwait, where her family were waiting. Canada's Foreign Affairs Minister Chrystia Freeland introduced the teenager as "a very brave new Canadian" but said that Ms al-Qunun was tired from her ordeal and long journey and would not be making any public statement on Saturday. "She is a very brave young woman who has been through a lot... and she is now going to go to her new home," the minister added. Canadian Prime Minister Justin Trudeau earlier told reporters that his country had granted a request from the United Nations High Commissioner for Refugees to grant asylum. "Canada has been unequivocal that we will always stand up for human rights and women's rights around the world," he said. How did she reach Canada? She arrived in Pearson International Airport on a Korean Air flight from Seoul on Saturday. She had tweeted photos that appeared to show her aboard the jet just before take-off, with the words, "I did it!" Ms Qunun told the BBC earlier that she was afraid her family would kill her. "I can't study and work in my country, so I want to be free and study and work as I want," she said. Separately, she told AFP news agency she had suffered physical and psychological abuse from her family, including being locked in her room for six months for cutting her hair. The UN's refugee agency (UNHCR) said it considered her to be a legitimate refugee and welcomed Canada's decision to grant her asylum. "International refugee law and overriding values of humanity have prevailed," said the UN High Commissioner for Refugees, Filippo Grandi. How did she end up in Bangkok? She had been on a trip to Kuwait with her family when she fled on a flight to the Thai capital, saying she intended to take a connecting flight to Australia and had an Australian visa. But she says her passport was seized by a Saudi diplomat when he met her coming off the flight in Bangkok, leaving her stranded. A Saudi envoy in Bangkok denied any official Saudi involvement in Ms Qunun's detention, and her passport was later returned. Thailand allowed her to stay and the UN assessed her claim for asylum.